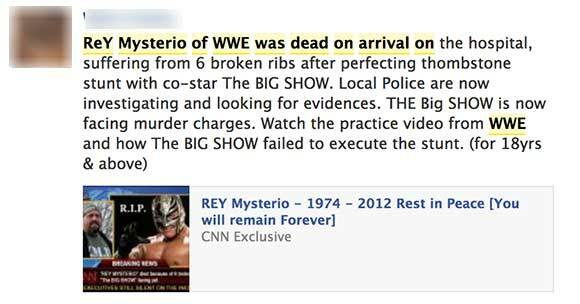 A spam message is circulating on Facebook that WWE wrestler Rey Mysterio has died in a stunt gone wrong. Social media is now full of spam messages like this. Last week scammers trick users with "John Cena is died" and this week, rumors about the death of Rey Mysterio. The message actually includes a link that supposedly provides more information about the accident, but in real spammer is just tricking users to redirect on survey website using his referral url. Complete message read,"ReY Mysterio of WWE was dead on arrival on the hospital, suffering from 6 broken ribs after perfecting thombstone stunt with co-star The BIG SHOW. Local Police are now investigating and looking for evidences. THE Big SHOW is now facing murder charges. Watch the practice video from WWE and how The BIG SHOW failed to execute the stunt. (for 18yrs & above)"
"But that’s not all. The user is then presented a webpage that promises him/her the chance to win an iPad, a Westfield gift card, an iPhone or a grocery voucher in return for the completion of a survey." softpedia news describes. In fact, the message is a survey scam designed to trick users into installing a rogue Facebook application and participating in various suspect surveys and offers. Those who fall for the ruse and click the link will be taken to a Facebook page and asked to allow what appears to be a "Get Access" app from WWE. 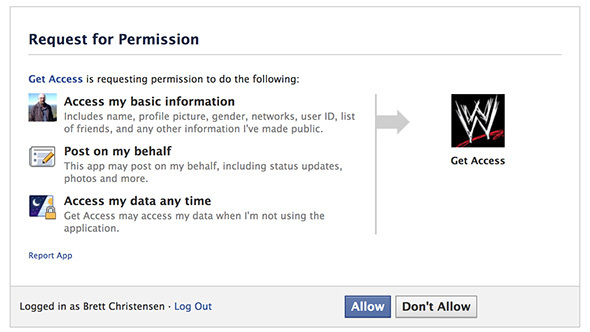 Once permission is granted, the rogue app will begin posting the scam messages on the user's behalf. So we recommend readers to see each link carefully, verify the facts and don't authenticate any fake application on your facebook account. Cyber Criminals are using various tricky methods these days to spread malicious links and sites url. In another report, we have warn readers about Spam campaign tricking thousands of users with shortened .gov URLs .